Scientists at Tokyo Institute of Technology examined the mechanisms behind the resistance at the electrode-electrolyte interface of all-solid-state batteries. Their findings will aid in the development of much better Li-ion batteries with very fast charge/discharge rates. Designing and improving lithium-ion (Li-ion) batteries is crucial for extending the limits of modern electronic devices and electric vehicles because Li-ion batteries are virtually ubiquitous. Scientists at Tokyo Institute of Technology (Tokyo Tech), led by Prof. Taro Hitosugi, had previously reported a new type of all-solid-state battery, also based on lithium ions, which overcame one of the major problems of those batteries: high resistance at the interface between the electrodes and the electrolytes that limits fast charging/discharging. Although the devices they produced were very promising and were much better than conventional Li-ion batteries in some regards, the mechanism behind the reduced interface resistance was unclear. It has been difficult to analyze the buried interfaces in all-solid-state batteries without damaging their layers. Therefore, Hitosugi and his team of researchers again investigated all-solid-state batteries to shed light on this topic. They suspected that crystallinity (which indicates how well-ordered and periodic a solid is) at the electrode-electrolyte interface played a key role in defining interface resistance. 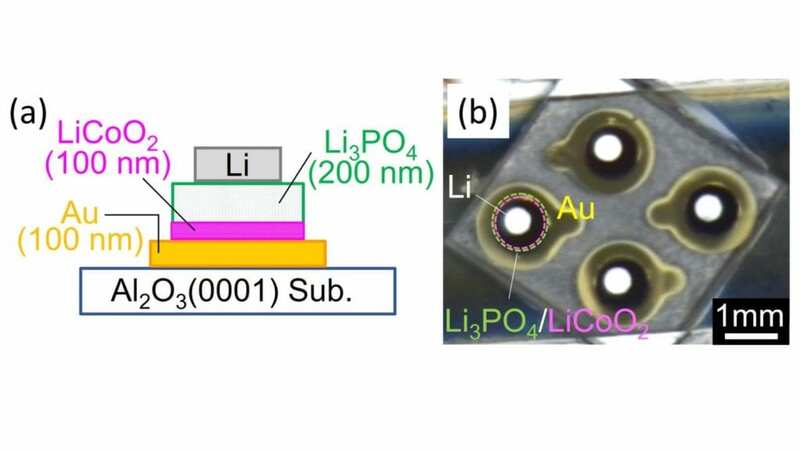 To prove this, they fabricated two different all-solid-state batteries composed of electrode and electrolyte layers using a pulsed laser deposition technique. One of these batteries had presumably high crystallinity at the electrode-electrolyte interface, whereas the other one did not. Confirming this was possible by using a novel technique called X-ray crystal truncation-rod scattering analysis. “X-rays can reach the buried interfaces without destroying the structures,” explains Hitosugi. Based on their results, the team concluded that a highly crystalline electrode-electrolyte interface resulted in low interface resistance, yielding a high-performance battery. By analyzing the microscopic structure of the interfaces of their batteries, they proposed a plausible explanation for the increased resistance of batteries with less crystalline interfaces. Lithium ions are stuck at the less crystalline interfaces, hindering ion conductivity. “Controlled fabrication of the electrolyte/electrode interface is crucial to obtain low interface resistance,” explains Hitosugi. The development of theories and simulations to further understand the migration of Li ions will be crucial for finally achieving useful and improved batteries for all kinds of devices based on electrochemistry. This work is carried out in collaboration with Prof. Susumu Shiraki at Nippon Institute of Technology and Senior Researcher Tetsuroh Shirasawa at the National Institute of Advanced Industrial Science and Technology. Nippon Institute of Technology celebrated its 50th anniversary in 2017. Our mission was, and still is, to raise outstanding engineers who can utilize theoretical concepts of engineering in the frontline of industry. We developed our unique method using “practical engineering”, making the best use of what students had learnt in technical high schools. The National Institute of Advanced Industrial Science and Technology (AIST), one of the largest public research institutes in Japan, focuses on the creation and practical realization of technologies useful to Japanese industry and society, and on “bridging” the gap between innovative technological seeds and commercialization. For this, AIST is organized into 5 departments and 2 centers that bring together core technologies to exert its comprehensive strength. JST is an organization that leads Japan’s science and technology (S&T) development as an innovation navigator. We aim to contribute to the lives of people and the achievement of a sustainable society by promoting S&T for the purpose of opening up opportunities in innovation. Since its foundation, JST’s many outstanding achievements accomplished in collaboration with the government, universities, the industrial sector and public have been earned global recognition.